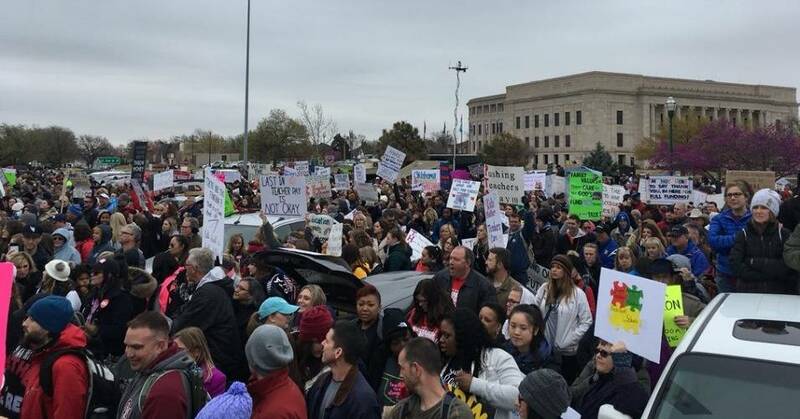 A weeks-long mobilization in Oklahoma resulted in teachers striking across the state on Monday, with tens of thousands of educators and supporters rallying at the State Capitol in Oklahoma City to demand more funding for schools and higher wages for teachers. Organizers planned to speak with state lawmakers about how decades of funding cuts have affected their schools—and why a bill passed in the legislature last week that would raise taxes on oil and gas production to give teachers a $6,100 raise and allot $50 million for school funding was not enough to stop the protest. An NBC News aerial video of the scene at the demonstration showed an estimated crowd of 30,000 people gathered outside the Capitol. Oklahoma Education Association (OEA) president Alicia Priest told CNN the package was “a good starting point,” but said teachers see it as a last-ditch effort by lawmakers to keep the strike from happening and not a genuine attempt to improve schools. The OEA is demanding a $200 million funding bill for schools, and a $10,000 raise for teachers over the next three years. As teachers across the state prepared to rally, four teachers shared in a CNN video the numerous side jobs they have had to take on to make ends meet while educating Oklahoma’s schoolchildren. One educator with 25 years of experience detailed his work as a bus driver, landscaper, and roof salesman. Another said she works 15 to 20 hours in retail to supplement her teaching salary. On social media, teachers and supporters also shared images showing the dire need for more education funding so schools can afford basic supplies like textbooks. Teachers boarded buses across the state early on Monday morning, with an estimated 30,000 expected at the State Capitol. As Common Dreams has reported, Oklahoma is just one state where teachers have railed against poor funding and chronically low pay in recent weeks. Also on Monday, a strike in Kentucky over changes to teachers’ pension plans continued, with educators traveling from across the state to the State Capitol in Frankfort. Most schools were closed for spring break, with teachers and supporters using their time off to protest—while 21 counties’s schools closed for the strike. Teachers in Arizona held a demonstration in Phoenix last week—also hoping to draw attention to per-student funding, which was cut by more than 36 percent from 2008 to 2015. The wave of protests follows the teachers’ strike in West Virginia last month, which shuttered every public school in the state for nine days and resulted in a five percent pay raise for teachers and an agreement to work towards funding for the state employee health insurance program. In all the states where teachers have been voicing their dissatisfaction, lawmakers have spent decades handing out tax cuts to corporations while cutting funding for schools and leaving teachers with stagnant wages. This entry was posted in Corporate Personhood, Corruption, Demonstrations & Protests, Economics, Education, Government, Peaceful resistance, Social Justice, Solidarity, Unions and Organized Labor, Women's Issues, Workers' Issues and tagged Capitalism, Civil Rights, Corruption, Economics, Education, Equality, Kentucky, Oklahoma, Protests, social justice, Solidarity, teachers, West Virginia, Women's Issues, workers' issues on April 3, 2018 by ew.